I have been missing my blog for a while now after this last move, and I was struggling to get back into managing my time well. I have been crafting, even if I haven't been sharing. So I'm gonna be sharing more regularly again, plus if you want to peek at what I'm working on, I post a lot on Instagram. CTMH just released the new Seasonal Expressions at the beginning of May, and this card is made with one of the newest paper lines called Jack. To me it's very Portlandia - beards, camping, lumberjacks with optional tattoos, and all the plaid. I was working off the sketch from Freshly Made Sketches. The background is Kraft CS stamped with the plaid border image from Jack - Scrapbooking, It comes with matching Thin Cuts metal dies for the images, and that's what I used to cut out the lumberjack and the banner. 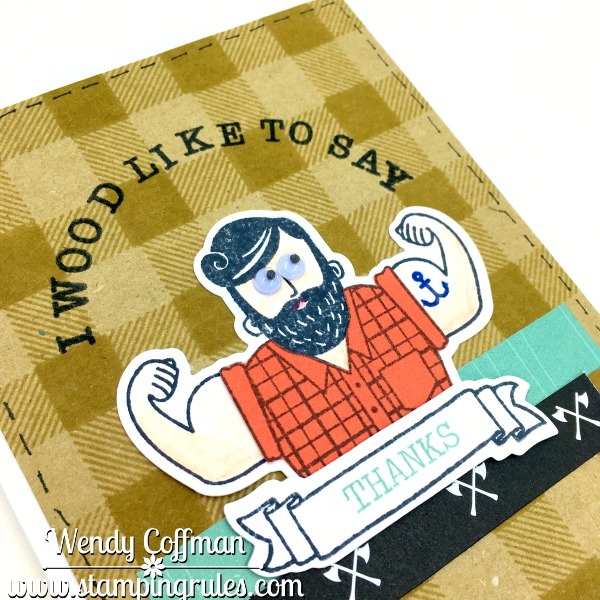 I paper pieced his plaid shirt with some Poppy cardstock, and popped one of his little tattoo images onto that impressive bicep! His skin is shaded in real life too, with watercolor pencils but I guess that color washed out in the light box. I created the sentiment using a very old set called Tiny Typewriter, because I am a huge fan of punny cards. Finally I added a couple of wiggly eyes, well, because wiggly eyes, and "stitched" around the edges with a fine point journaling pen. I WOOD like to thank y'all for hanging in here with me while I got my legs back under me from this last move. 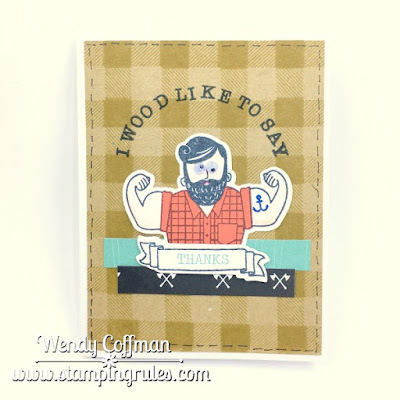 See ya again soon, Stampin' Friends! Unicorns and Rainbows Workshop Info! What a fun card! Those googly eyes are hilarious! Thanks so much for joining us at Freshly Made Sketches. I love how you made that background. Very trendy and creative!